I have a few quick links, videos, and Kickstarter innovations that I’ve been saving up, so I’ve consolidated them on today’s post with some commentary from me. I’ve heard a theory about the success of The Tonight Show with Jimmy Fallon that made me think of Kickstarter creators. 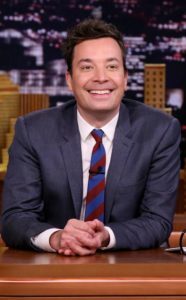 The theory attributes the success of the show to “The Fallon Effect,” which is that because Jimmy Fallon looks like he’s having fun, you also feel like you’re having a good time when you’re watching the show. If he/she is having fun, you’re having fun. My observation here is that I’m drawn to Kickstarter creators who look like they’re having fun (even though in reality they may be tired and deflated). I’m not necessarily suggesting that creators should fake their true emotions, but I think there’s something to be said for letting yourself have a good time when you’re interacting with backers through updates and live video. Your public persona has an impact on how backers feel about the project. It’s exceptionally rare that I receive a handwritten note in the mail, and when I do, it’s typically from my parents. So you can imagine my surprise when I received a handwritten letter from the creator of a Kickstarter project I backed in 2017–a project for which I had received the reward quite some time ago. 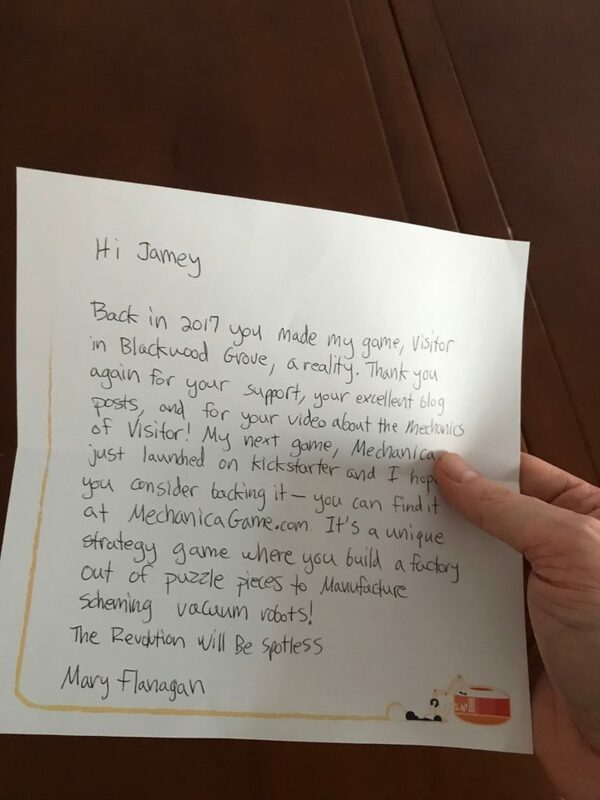 I don’t know how many of these Mary sent out, but I love that she took the time to actually write out a note to some backers of a past project to encourage them to look at her current project, Mechanica. If a local friend hadn’t already backed the game, it would have jumped to the top of my list. I think this is an interesting strategy to consider for repeat creators, especially if you can identify some influencers among your original backers. I was really touched by the gesture, and the handwritten element of it made the letter personal without being pushy. 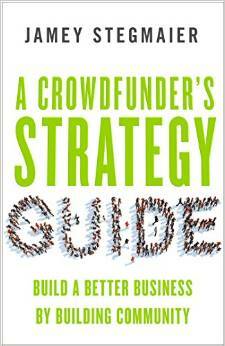 Have you seen, read, or heard anything interesting about Kickstarter or entrepreneurship recently that piqued your interest? Feel free to share in the comments below! Another awesome article, I think I agree with everything on there. I like the letter idea especially, I have thought about writing a letter to all my backers for my first KS project if it is able to fund, but hadn’t thought about the angle of writing to past backers. Also that was a great speach by Spencer! Especially since you can see our Seattle game community at the 21:50 mark (Im just barely in the picture at the bottom left) but we are truly fortunate to have the community we have here in Seattle. Nice piece here, Jamey. I watched Spencer Harris’ presentation; the points he makes certainly resonate with me, and being in the same place interacting over a game is maybe my wife’s favorite aspect of this hobby. Thanks Chappy! I can relate to that as well, especially as an introvert who enjoys the more structured interactions that tabletop games provide. Jamey, you describe me so well: “an introvert who enjoys the more structured interactions that tabletop games provide”. And, I might add, one who values the friendships that can develop from the initial structured interactions. First of all Spencer Harris is pretty much the best. And the con in Springfield, MO that he mentioned Moon City Con (Of which I am a founder) will be launching their Kickstarter to fund the 2019 con tommorow, Feb 12th at 12:00pm central! We’re very excited to do it again this year and want to thank you Jamey for supporting is last year with play and win games! I humbly invite everyone to search for Moon City Con on KS tommorow and help us make SW Missouri the next board game hot spot! This is a question rather than an addition. I’ve seen reviews of a number of companies that fulfill Kickstarter backer rewards; but what about companies that handle the entire Kickstarter logistics—video creation, Kickstarter site presentation, etc., with the product creator providing updates and responding to comments. Are there any such, or would that run too much against the creator kIckstarter graIn? If so, any reviews? Dorothy: I do have an older post on that topic, though I don’t think I’ve ever heard a firsthand account of someone who hired such a company to run their campaign. On the first Kickstarter I launched, I promised a handwritten note to all backers. A word of advice: do not underestimate how long it takes to actually write out a not. You want to make the note look and sound nice, and ideally customize it for each person. We only had about 100 backers, but it probably took, at best, 6-10 minutes per note. Which maybe doesn’t sound like a lot, but that’s about 10 hours spent writing notes.